vii, 25 p. : ; 23 cm. Reuse of record except for individual research requires license from LexisNexis Academic & Library Solutions. CHRISTOPHER J. DODD, Connectient MICHAEL T. B LOUIN, Iowa . nology to eriii controli----------- ---------------------------------. i~heS pcialOvesigt hearings covered by this report were held foe th pupos considering the current and potential application of ciece nd echolgy to crime prevention and control. The heariW wreotuctued t gain an insight into current efforts to bring amece nd. tchnlog t bear on one of the nation'sn major problemsIntragncycoodintion and intergovernmental cooperation rece~ied rimry mphsis while specific techniques -forhnrie control and preention ereas discussed. .. Te Sucon=tterived testimony *from witnesses repredinag' theresarc ommnit, the potential users of new techniques, and FW*l gecie wrkng to apply scientific and tehooia advanes:todea wth rie prevention and control. Ba sed on h hearingg: te fllowng ecnmendations for future activitis are made. 1',S. 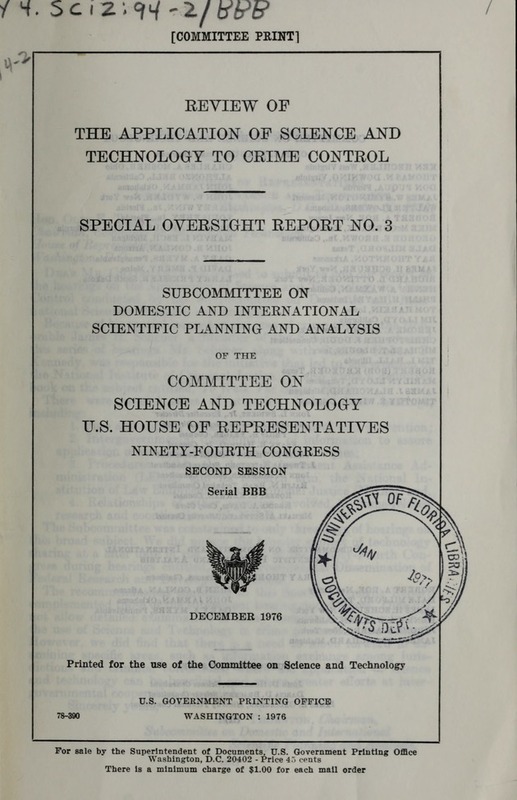 ous ofReCommittee on Science and Technology, Ninety-Fourth Congrees No.25,Subomitte= 10tu e and International Scientific Planning and Analysis. Special Oversight Hearing on Te Appicati n cee and Technology to Crime Control, July 1975.
niqum, anti, erds, Jini:gdittidtig rivahiok 6&A&Meh"
W ib e gi thoitlbR". grant program to effect this cooperation..
consideration of the victim of crimes. Programs in crime prevention and control that are successful should be evaluated for continued federal assistance. Often local units of government are faced with the problem that once a program is proven successful, fun" is no longer available. Shifting emphasis in R. & D. priorities often work to the disadvantage of the most innovative cities unless they can restructure programs to fit the current areas of interest. whether to proceed with prese-nt or planned activities. efforts related to crime control, and; are R. &Rresutsl iiv potential for improving the criminal justice system ismiae effectively to jurisdictions aeroshe nation? control. The National, Science *Foundation ,and :she Conie06tt Governments, while..involved in rewearoh -related to armnt,.u combine R. & D. activities with planning, evaluation, an if oatm dissemination efforts secncerebyg Ja btadd age &o donesi~eve in e -nanner that, nakes separate rbu tfigurgaes diliculto teedevelop. housing, poverty, education, ethc. 'Acivtie oftheraecsae related to this problem because of the interrelationshisormet the, entire social -and cultural -fabric of. the -nation. "ToeOecs represented at the hearings were invited, :because of -hi ii programs directed: at crim control and prevention. by reaivl sml ut fse oewic wsmr~humth4 y.. I think you ceald testermannh better newet'o phasing,,andvan yig ..
1Mr. Shah and Mr. Platbath. responded 'that toe,1~~akei"
the particulAr study was'to deve46p a statistics 1I6bae y ita'wi some expansion to a "second stage" there 'Weould be on-'effort toi'n characteristics of "high risk" individuals and dev610phanit of'p of prevention. the various elements of crime prevention and control as well as'.de community' s efforts to affect reform inthcomnyatlre following section seeks to address the issue of how, well the perspeetv~ of identifiable needs mesh with activities-at the Federal 10A:t undertake R. & D. in the, field of crime Drevention and control. Agsiads and submitted a research Plan for the record. app nnaionof $0 hillion and staff. comnpement -of 85.
their views nas to the effectiveness of LEAA and the Nationtal ni regarding first. the pure researrth developnibnt fatidtidninapir science and technology to the criminal justice systdss effectiveness as a clearinghouse- Getting information oUn- w techniques and approaches that, work, and, finally; renemtf improvement in LEAA's operations. agencies faces its own problems. It is through the e,_d-W, effective R., &, D. undertaken at dlie Fdital level Aloio be I'e minted at tile 8tate and local lev et. However"Mi:14 pyn. th ipat f ublic housn ocrmprevention and:-contraeMr Murphy noted the close interrelationship of, crime to other A problems and suggested that due to.the imitation of totAlp" funds and NILE funding specifically, other. agency iesisauch at4 National Science Foundation, the Department of. Health, Edueto. and Welfare, and the Department of Hosngad1ra Develop should utilize their resources in combined effort in a, naon-has MM approach to crime prevention. 1 .
rovmen 8 i thutt where necessary. iwoold &semn tinof & D. results and funding priorities. right is an empirical question that we can answer. That is.wbat,:06 Institute isabout." The question of evaluation of projectsis inextricably ,bound tar funding procedures. Earlier discussion suggested-that jurisdietioso had. to play word games to present "innovative" projects for fundiag. In discussion with Mr. JCaplan, Congressm&n. Sch I uer eVrease& concern with criteria for continued funding. Are, suecessful PTdift, tA A? There has been little consideration of funding mechanisms orussist ance for the innovative city to delmonstrate their results. The consumers within the Criminal Justice Agencies are experimenters of on uncontrolled type. They attempt to implement one kind of'change and then another kind. What I sense among what I call poUcy*makers---these woulct be the legislative staff, people in the Governors' offices and so forth, who are vontrollisW the flow of dollars and directing changes in legislation-they are gettingv" disturbed about the seeming confusion and conflicting requests about changes, and they are beginning to ask for harder information about the impact of those changes before they proceed any further to make them. We went through a flurry of changes in the late 1960's- and early 1970's, largely, as a result of the influence of LEAA dollars. Much. of this money has,, in retrospect, probably been used unwisely because it was not preceded by reseaicti; I ineau, it preceded research rather than followed it. I think that we have to work more to bridge the gap between research and development andthe actual implemenUtibrtv. 16, re~iarel imitiate by NIMIT and carry it to implem entation aibitong aoveneffective. IUMtifd sakte of An alth (NMMB}. nvled. in: crime prevention and control and, is concerned with both beai and applied research. A.. e n m .
only brieffyon the specific, areas for ai future R. & D.
pared given OMB, Congressional and user community guidance,. 3 b a lead to %some haOreIserious wrong conclusions, could it not? either into eaction, woith R f & otnut intepogD.tht h Government s pr ceded b.yca' testi:d10490~~big tq Pubic Tdchnology Inc. He denti. DWUDolice hardware needs-techiiology developments foir the police .fttAstreet level-and; police software needs in three areas---m n a ..
seot dedling with specific areas with potential for RE. & . possinsaimfficient attention to coordination at the Federal agency P0? his led to the question of Dr. .Averch from Mr. Scheder "Where A proper plae in the Federal Government R. & D. establihent lar the r**m of the streams of information to take place?" b ro gon of federally funded R. & D,. Mr. Scenavan What would you suggest; what would your recommaedatiote? bpkto the agemes and say, "Look -here is what we are saying." Da A=. I think ths awe may options; you ean set it up as an iadependent kind of operation, as you mentioned, and you could attach it to OMB. M r. BaHEvan. God forbid. DAv Recer. You couli attach it to NSF, for we have no particular interest Io programs oateames. I cealdn't tell you at the moment what the meet csteOfaptive arangeinents weald be. In addition to coordination among the different agencies undertaking R. & D. related to crime prevention and control, each agency is faced with an internal problem that they share in common. The concluding section addresses this issue. mhenstotae oni oustan pe o aea uthuaeebn ie for, y have a a fexibiity' w e .o eat tin pe r.
School of Urban and Public Affairs, Carnegie-Mellon Uni---- ItVM3111y, ittsburgh, Pennsylvania. Dr. J h D. McNamara, Chief of Police,, Kan as City, Missouri. Lloyd T. Ifedik, Program Director, Urban Consortium for Technology Initia ves, Public Technology, Inc., Washington, D.C.
William V. Donaldson y Cit Manager, Cincinnati, Ohio. Admini tration, Department of Justice, Washington, D.C.